According to the latest satellite assessment by Samarco of a tailings dam burst at its Brazilian iron ore mine that devastated the country's second largest river system, the Rio Doce, the tailing waste spill was much smaller than previously determined. BHP Billiton, which jointly owns Samarco with Vale, said in its 60-day update since the November 5 incident, the volume of tailings material released when two dams were breached was about 32m cubic metres. Initial estimates were put as high as 60m cubic metres. Samarco also found that approximately 85% of the released tailings were retained within 85 kilometres of the Fundão dam. Samarco is undertaking several activities to stabilize the released tailings and to prevent more material from entering the river system, including constructing dikes to contain tailings and revegetation along the Gualaxo and Doce rivers. Work to repair and reinforce the Selinha dike above the Fundão dam in the Germano complex is complete according to the statement while the company is continuing to reinforce the Santarém water dam which overflowed, but which retained some of the tailings from Fundão. The Brazilian government announced a $5 billion civil damages lawsuit last year, but warned that "the figure is preliminary and could be raised over the judicial process, since the environmental damages of the mud’s arrival at the ocean have not yet been calculated." 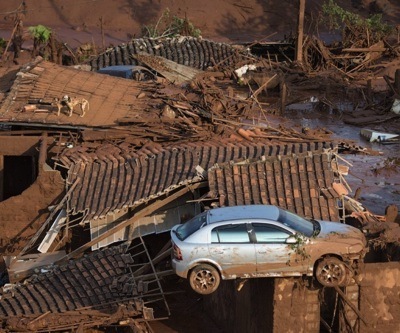 The disaster in Brazil’s Minas Gerais state that killed at least 17 people and left hundreds homeless, caused sludge to wash downstream into neighbouring state Espírito Santo through remote mountain valleys reaching the Atlantic ocean 600 kilometres away.